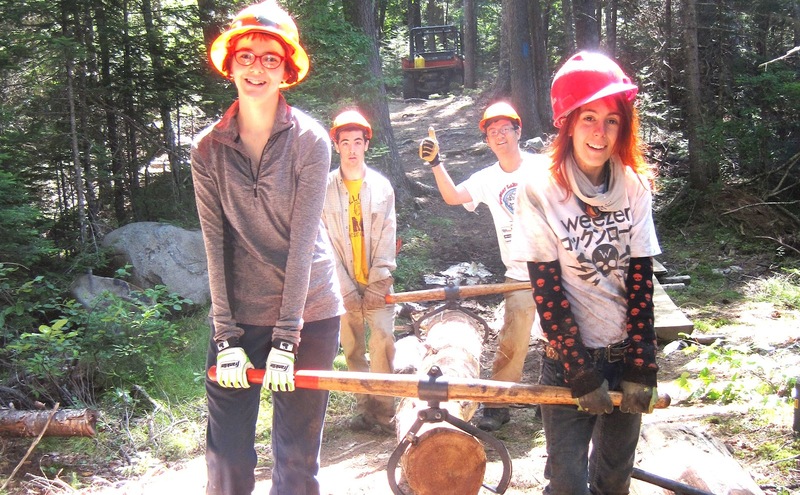 The Maine Woods Teen Trail Crew session one has been busy this week carrying logs and litters. The weekend began with construction on a ski trail bridge. 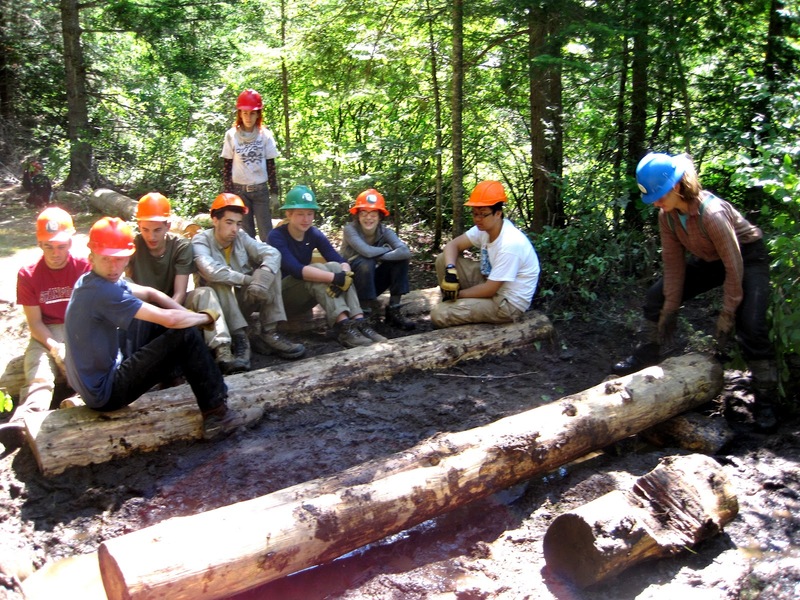 The crew kicked off the project by hiking thirteen 8 foot long logs to the work-site a quarter mile down the trail. Crew members split into groups of four and carried the logs using log tongs. Trenches were dug, rocks were popped out of the ground and the crew set to work getting the extra long base logs secure in the ground. Construction on the bridge was disrupted by an emergency call from a local Maine Game Warden. 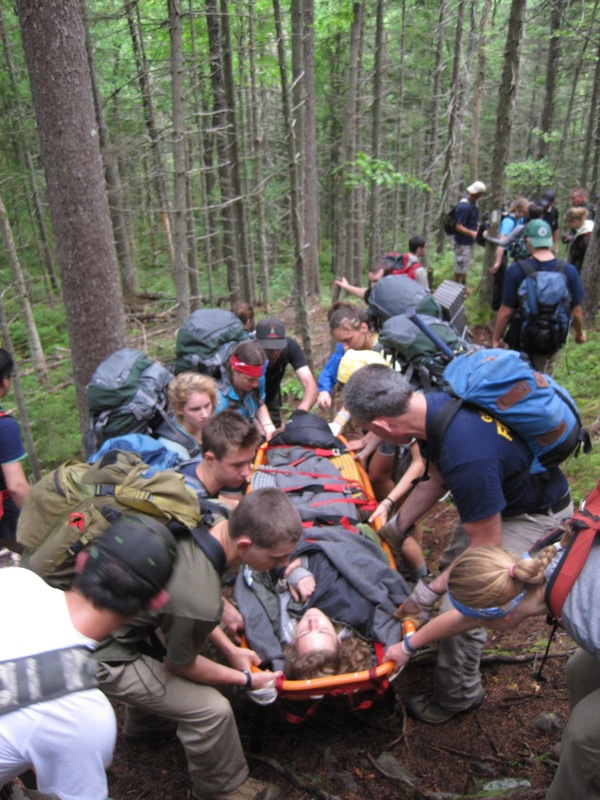 A young woman section hiking the Appalachian Trail with a camp group had badly injured her ankle and was unable to hike out of the woods. The Maine Woods Teen Trail Crew woke up early Sunday morning and assisted with the rescue efforts along with a group of Maine Game Wardens and staff from AMC Gorman-Chairback lodge. Teen crew members carried the litter up Third Mountain Trail to the Appalachian Trail and helped carry the injured girl back out. 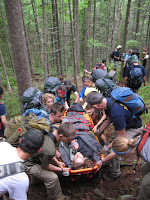 It was strenuous work but the crew's spirits were high and everyone contributed to making the injured hiker as comfortable as possible. Logs and litters are testing our strength and endurance but the Maine Woods Teen Trail Crew is rising to the challenge. Heavy logs, injured hikers, swarming bugs... BRING IT ON! Maine Woods Teen Trail Crew #1 !